Thank you for reaching out to learn more about Rehmann. We understand how valuable your time is, since today's business leaders are required to make more decisions than ever before. A 24/7 global economy means you have to make those decisions faster than ever before, too. 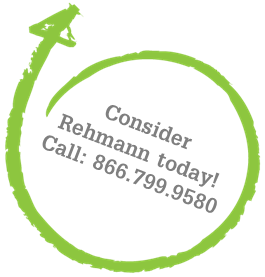 Consider Rehmann and our one-of-a-kind the Rehmann Experience to help you keep pace with all of the changes taking place in business today. Begins with a comprehensive analysis of your unique situation, often conducted by a professional with years of direct, practical experience specific to your particular industry. Involves your Rehmann business advisor leveraging nearly 800 cross-functional associates across 21 offices in four states to assemble a team with the optimal combination of skill and experience to support your success. Includes a richly collaborative environment where you and your personal Rehmann team create customized, proactive solutions for the challenges you face today and the opportunities you’ll be prepared to seize tomorrow. Our goal of delivering total client satisfaction powers the Rehmann Experience. It's why we're not only one of the largest accounting and consulting firms in the Midwest, but one of the top 35 accounting and consulting firms in the U.S.
We provide services to many industries, including retirement services and services to many industries including, Financial Institutions, Healthcare and Manufacturing. More than 75 services, in fact, including the remarkable new CFO Executive Advisor service. We encourage you to learn more by contacting the associate whose greeting is featured inside the Rehmann package you received recently. Didn't receive a package? Feel free to call us at 866.799.9580; we'd love to meet with you. The seasoned wisdom and industry experience of our associates may provide just the acceleration you need to meet the demands of today’s rapidly-evolving business world. Experience it for yourself when you consider Rehmann.